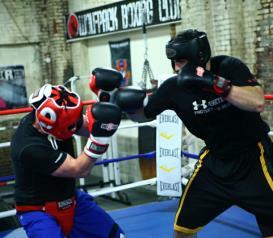 How Do I Start Training At Wolfpack Boxing Club? If you have never trained in USA Amateur boxing before, then you are required to take two Intro classes. Intro courses are held on Wednesdays at 7:00pm and Saturdays at 11am. 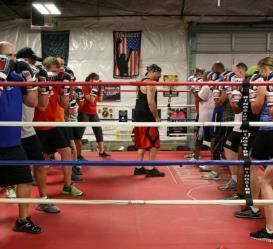 These classes teach you the basic fundamentals of boxing to help you prepare for class. Please call the gym at 412-335-2419 or email us to pre register for this session. This session is limited to very small groups and fills up quickly. The Intro class is designed to show you the basics of amateur boxing beginning with your fighting stance, footwork, jab and cross as well as some basic defense. The Intro Classes need to be scheduled ahead of time with one of our coaches. There is $50 charge for the two sessions. *If you have previous formal training, we will arrange for a special evaluation session to determine which class you would be enrolled in. Do I have to take the intro course if I've trained in boxing before? If you have had USA Boxing certified coaches teach you previously, you are not required to take the intro course. One of our coaches will be happy to evaluate your skill level prior to your first class. If you have not been formally trained by a USA Boxing certified coach, you will need to take the intro course (this includes boxer-cise/boxing fitness classes, Muay Thai, Karate, Wrestling, Jui Jitsu, Etc.). We take this very seriously and require sound boxing fundamentals prior to attending any of our classes. No, simply come dressed in comfortable workout clothes (sweats, shorts, sneakers, etc.). We have everything you need to get started boxing (hand wraps, jump ropes, gloves, headgear etc)! If you would prefer to purchase your own equipment, we recommend 16oz training or sparring gloves and 180" Mexican style hand wraps. However, we provide all incoming students with a free pair of hand wraps for the intro session. We have a nice variety of boxing equipment that can be purchased at our gym. You can also shop online at two world-class boxing sites: www.ringside.com or www.titleboxing.com. .
What happens after the Intro Class? You can attend any of the classes (for your level) that we offer on the schedule. You do not have to pre register for classes, you can just show up. Please refer to our schedule page for the current class descriptions. Each class is one hour except for morning and lunch classes (45 minutes). View our class schedule. Here's a video on how to wrap your hands for class. I'm not in great shape, will I survive? This is the most common concern. Not to worry. Although boxing is the hardest and most intense sport in the world, we encourage new students to simply go at their own pace. We don't want any injuries to occur or for you to become discouraged right out of the gate! We'll push you, but not ride you like a drill sergeant! We are all about making you feel comfortable and getting the best workout you can for your own fitness level! What do classes consist of? Boxing is all that we do! Our classes are structured and will teach you all the aspects of boxing and also incorporate conditioning. Typically, classes consist of drills, bag work, focus mitts, circuits and other forms of conditioning. These are not boxing aerobics classes, we're here to teach you how to box and get you into boxing shape - and it will be the best workout you've ever experienced! Note: there is no head contact in the Basics class - and none is ever required unless a student intends to spar eventually. Yes, (contrary to popular belief) you can learn boxing without getting punched in the face! Do you offer women's boxing classes? Over 45% of our members are women. However, we do not segregate our basics classes (men, women and children over 8 years old train together) due to our non-contact policy but we do have a women's-only Intermediate class. We have designed our programs so that everyone and anyone can come to our class and learn boxing safely...and more importantly, have fun and get into the best shape of your life! We do offer a women's boxing special for new members! Do you offer youth boxing classes? Yes, we have a minimum age of 8 years old to join. We currently have many children under 13 in our boxing classes - some of which even workout with their parents (who join with them). We do require that parents remain on the premises during their child's class. We do not separate out children in our basics clas due to our non-contact policy. I do not want to compete; can I still come in and train? YES! Our boxing program was designed for just that reason. Wolfpack has also found some of our best amateur boxers in our classes, so you never know - no sparring or head class is required to learn at our gym! Do you offer training for people with Parkinson's Disease? Yes! Our coaches are ROCK STEADY BOXING certified! We offer classes Monday-Friday from 10am-11:15am, Saturdays at 9am,Tuesdays/Thursdays at 1pm and Monday evenings at 5:30pm! We require everyone go through a one hour, 1-on-1 assessment before joining our program. The evaluation allows us to show you the basic fundamentals of boxing as well as lets us determine which "level" would be the best fit for you. The cost of the evaluation is $25. We do request that you have a family member with you and that you've been cleared by your physician. You can see our complete pricing on our membership page. You can also learn more HERE. We offer classes, open gym and a combination of both! Again, check our membership page. Look at it as the more you buy, the cheaper it is per class. We accept MasterCard, Visa, Discover, American Express, checks and cash. You can pay/renew online here. Once I sign up for class, can I also use the facility to work out on other days? Absolutely! Once you are enrolled in classes, you are welcome to also use our facility any other days. Open gym is included in our class membership. Like any other gym, there may be other classes going on so please be respectful. Do you offer open gym for boxing only? Yes. You must either have previous formal training or attend our two intro courses prior to being admitted to our open gym membership. No classes or instruction is included with this membership.Classes take precedence on all equipment. Sparring is not allowed by open gym members except with prior approval from management. We are a boxing only club. We do, however, help many MMA athletes on their boxing skills! If you want to improve your stand-up game, call us! I have previous Amateur boxing experience, can I just jump into intermediate or advanced level? Our coaches would need to evaluate your skill level to determine what level you would be best suited. Click above for the new member waiver form that is required to be completed prior to your first introductory session. NOTE: if you complete this form BEFORE you are scheduled for an intro session, you will need to call and get a date.